This easy pan sautéed Greek style Lamb Chop recipe comes together in no time. 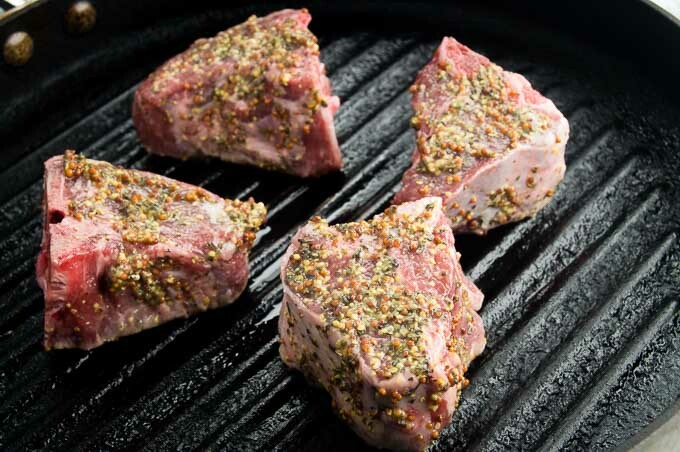 Marinated in Mediterranean herbs and spices and brushed with mustard each little chop is tender, juicy and flavorful. We love lamb chops in our family, they cook up quickly, come in nice portion sizes and are super flavorful and juicy. When the weather is nice I grill them (see these No fail grilled lamb chops) but when the weather is on the cooler side I make them These Greek style lamb chops which made on the stove-top. How do you pick a good lamb chop? Lamb tends to be very tender, but you do want to have some marbling that you can also see in the photo below. 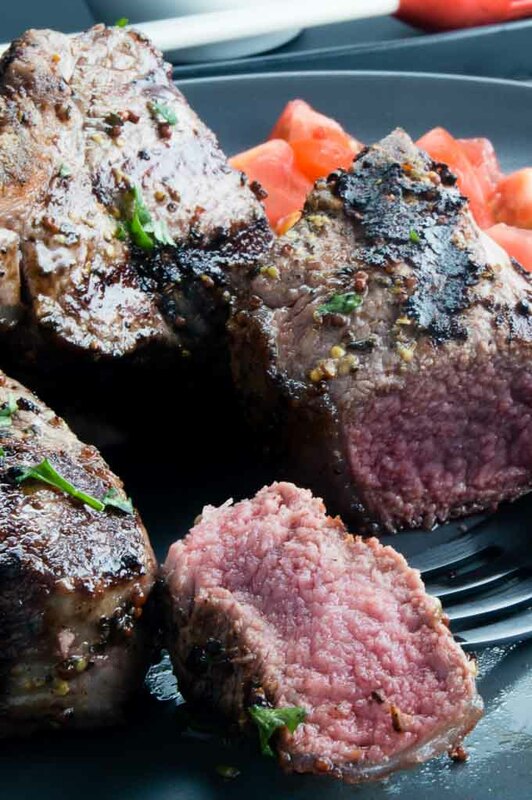 How do you prepare / cook Loin Lamb Chops ? Make sure to season all sides edges, not just the top and bottom. This gives you a great Mediterranean flavor in each and every bite. Browning all of the edges not just the top and bottom yields great results. You’ll want to get a deep brown crust on all sides, even on the top where its just the bone. This allows for even cooking and allows for the chop to be warmed throughout! 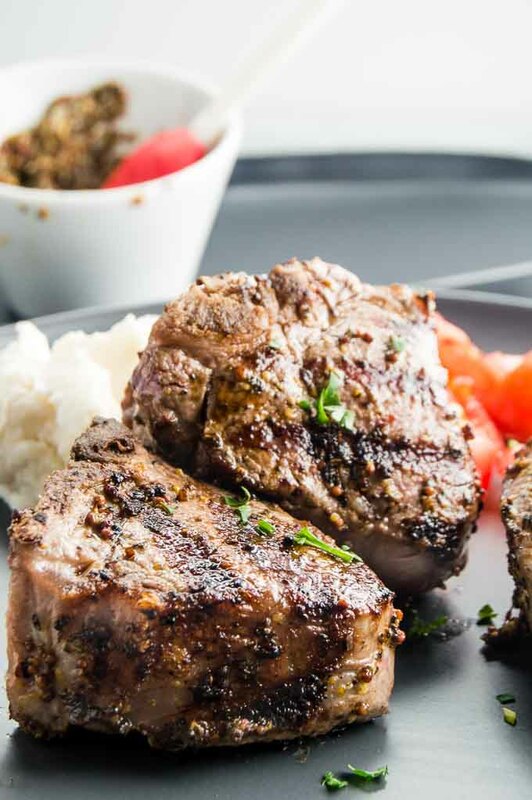 This Greek Style Loin Lamb Chop Recipe is very easy to make. 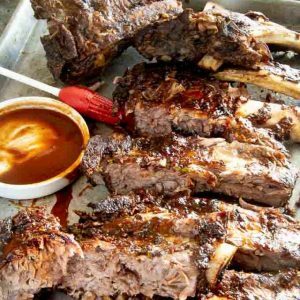 You season and let them marinate for about 15 minutes then you can cook them in a sauce or grille pan in less than 15 minutes. Each bite will be juicy on the inside and a seared crust on each edge. The mustard adds a slight tang and also holds all of the spices to the meat so every forkful is full of flavor! 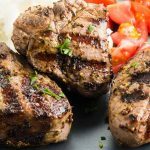 Looking for other Lamb Recipes? Irish Lamb Stew Easy how to video here! Grilled Lamb with a blue cheese butter here. 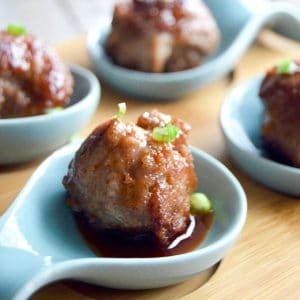 pin this recipe to your Entertaining board so you have it when you are looking for things to serve! Into a small bowl, mix mustard, oregano, thyme and 1 TBS olive oil. Blend well. Season all sides generously with salt and pepper. Then using a basting brush, spread on mustard mixture to all edges of the lamb chops. Let Lamb Chops sit for 15 minutes. Heat a grill pan or a skillet to high. Add last remaining Tablespoon Olive oil to pan and swirl to coat all sides. Place chops in on ends and cook for 2 mins. Then turn and place on narrow side (the chop side, not the top and bottom) and cook for 2 more minutes. Repeat with other narrow side for 2 mins. Then cook about 4 mins per side until lamb reaches medium rare (130°). (I cut into one chop to make sure its a doneness Im happy with if I dont have a thermometer handy.). Remove from skillet and allow to rest for 5 minutes. Then serve immediately. This looks like such a wonderful meal! I love the combination of flavors! YUM!!!!!! I can’t wait till I can grill so I can try these babies! They look fab! Greek flavoring has to be one of my favorites!! This is an absolutely stunning meal! If I ever show up at your door don’t answer because I will never leave. 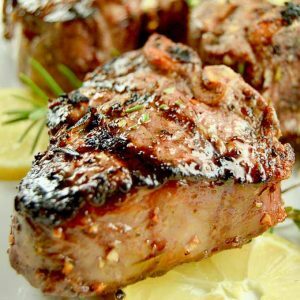 These lamb chops look absolutely amazing and are cooked to perfection. I love the Greek flavor profiles and it is the perfect match for lamb! I’ll be making these babies! I loveeee the simple yet delicious flavor you used on the lamb! I am looking forward to trying this one soon! 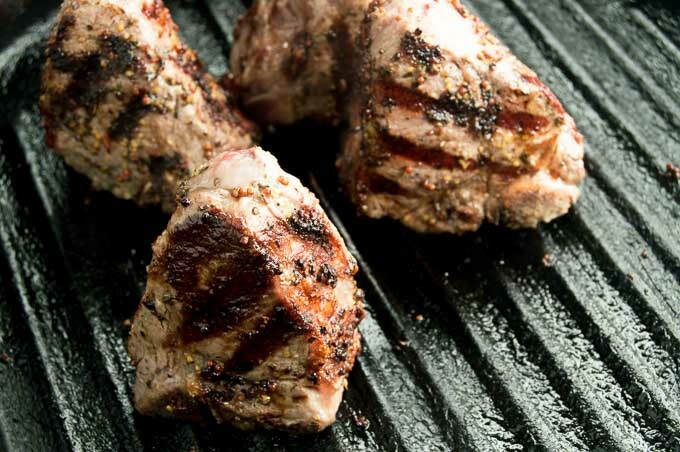 The lamb is perfectly cooked and your spice mix sounds amazing! Thank you for the tips to pick a great lamb chop too! Dan’s going to love this meal! Thanks for the tips on how to pick a good lamb chop! I usually rely on the idiots behind the meat counter at the store or my husband but nice to know I can pick one out by myself! This looks amazing and will be a hit on Valentine’s Day! 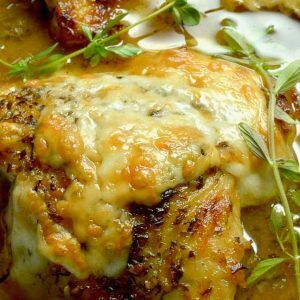 So easy and yet such an impressive dinner! My family loved the flavors! I absolutely LOVE lamb! 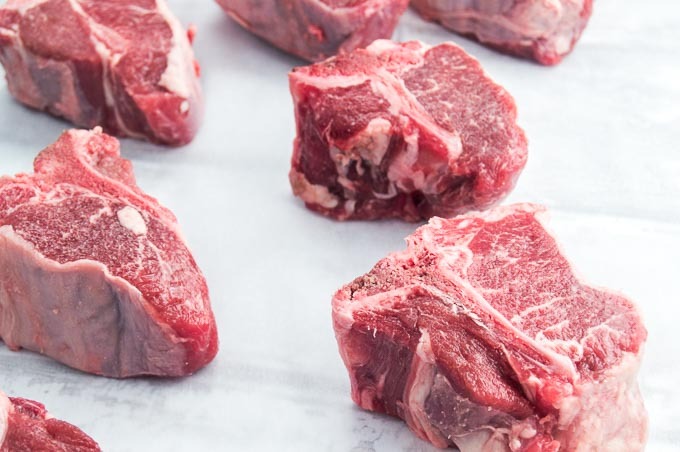 These lamb chops look and sound so incredible, I can’t wait to try them! Oh my word! These lamb chops look phenomenal!!!! Oh my goodness, these lamb chops look incredible. I’m seriously salivating just looking at these pictures. These are so happening at my house very, very soon! These look so amazing! I love the Mediterranean flavors and how easy this is to make.